Fender is taking the instrument back to its roots - with a few refinements, that means a solid alder body with a three-ply white pickguard. Fender also added special shielding in the body cavities for quieter operation and reduced hum. Newly designed bridge block with adjustable saddles For the Standard Series Telecaster, Fender designed a new bridge block that's the best of the vintage and modern designs, along with six adjustable saddles. The original Teles had a large, silly "ashtray" bridge cover that every guitar player hated, so they removed it and it promptly got lost for all time. Two new Standard Tele single-coil pickups The original Tele pickups had more twang than any two "normal" guitars, thanks to the single coil pickups in the bridge and neck positions. Today's Standard Tele has pickups that pretty much look the same, but are voiced hotter, so it's much easier to drive most amps into various levels of distortion, from mild to manic. Leo Fender wasn't a guitar player. In fact, he got his start repairing radios. So he had no idea that guitars weren't supposed to have maple necks. In time, those blond maple necks and fingerboards became a Fender trademark, though the company eventually offered rosewood fingerboards on most of its models. 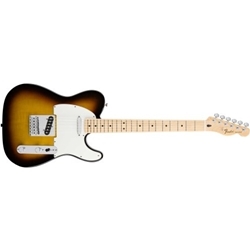 Again, for the Standard Tele, it's back to the basics with a maple neck and fingerboard with a modern "C" shape and a satin polyester finish on the back and a gloss finish on the fretboard and headstock.